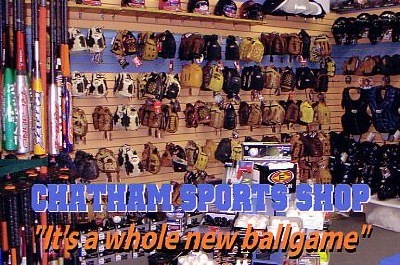 At Chatham Sports Shop, we want to give you the opportunity to stay in touch with our company and offers. We'll be offering more information and products online and partnering with community organizations for special Fund Raisers. Our goal is to make your sporting goods and uniform purchases as convenient and easy as possible. You can reach us at 1-973-635-3595 and by fax at 1-973-635-3983. We're looking forward to hearing from you. You can also contact us at our e-mail address: TMcCabe@chathamsports.net and SJMcCabe@chathamsports.net. If you're not familiar with our company and your first contact with us is online, we would be pleased to hear from you! Please let us know what your needs and questions are, and we'll be more than happy to help. We're located at 257 Main Street, Chatham, New Jersey 07928. Copyright 2008, Chatham Sports Shop. All rights reserved.